1 In the fourth year of King Darius, the word of the LORD came to Zechariah on the fourth day of the ninth month, which is Chislev. 2 Now the people of Bethel had sent Sharezer and Regem-melech and their men, to entreat the favor of the LORD, 3 and to ask the priests of the house of the LORD of hosts and the prophets, "Should I mourn and practice abstinence in the fifth month, as I have done for so many years?" 4 Then the word of the LORD of hosts came to me: 5 Say to all the people of the land and the priests: When you fasted and lamented in the fifth month and in the seventh, for these seventy years, was it for me that you fasted? 6 And when you eat and when you drink, do you not eat and drink only for yourselves? 7 Were not these the words that the LORD proclaimed by the former prophets, when Jerusalem was inhabited and in prosperity, along with the towns around it, and when the Negeb and the Shephelah were inhabited? 8 The word of the LORD came to Zechariah, saying: 9 Thus says the LORD of hosts: Render true judgments, show kindness and mercy to one another; 10 do not oppress the widow, the orphan, the alien, or the poor; and do not devise evil in your hearts against one another. Dude, It's Not that Hard! Zechariah and Haggai are contemporaries with a very similar vision of the future restoration of Israel and their writings may have circulated together. Here a group from Bethel arrives in Jerusalem on December 7, 518 B.C.E. and asks about fasting. 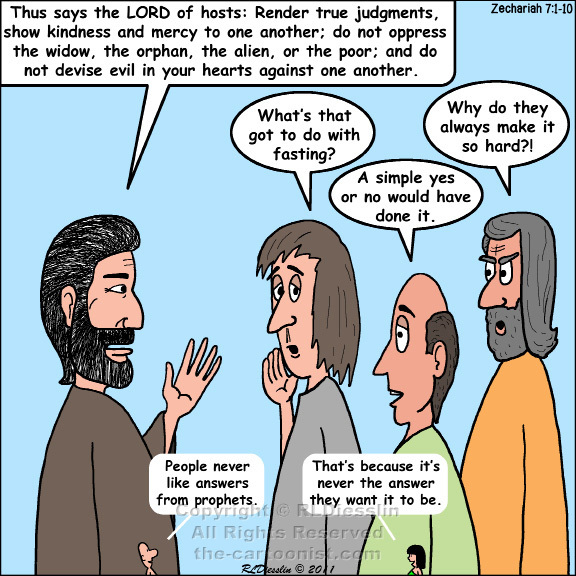 Zechariah perhaps questions the motive of their visit warning against hypocritical fasting and redirecting the answer toward social kindness and compassion. His answer is pretty much another way of saying the golden rule! Still just as hard to follow today as it was then, and still just as relevant.